It’s easier lying down… but not by as much as you might think. I’ve written before about the power advantage my High Baron recumbent enjoys over my normal road bike, but only in the context of a ~20 mile commute to work. I found that on average each recumbent mile cost 36.2kCal, versus 47.3kCal for each upright mile. If that held out for a long brevet, it would be a significant advantage to the recumbent platform (a 3800kCal saving on a 600km brevet, for instance). But how comparable is my commute, an hour pretty much as fast as I can go, with an all-day or even a multi-day effort? Now that power meters are getting a bit more commonplace, it’s easier to answer this question without going to heroic solo efforts in the name of science. 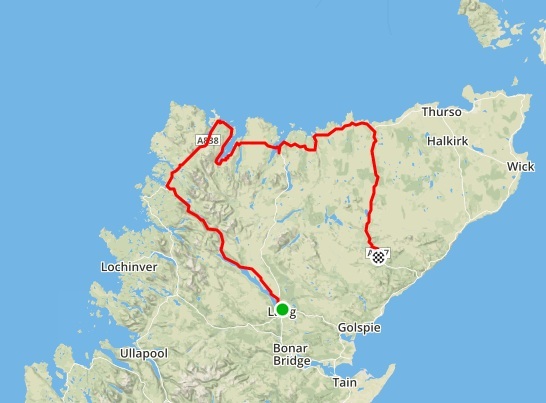 I rode the National 400 out of Dingwall this year, 256 miles (or ~400km! 😉 ) with around 14,000 feet (4270m) of ascent. Rather than ride the National 400 route twice on different bikes, instead I’m going to compare my power with another rider who did the course on the same day. The advantage of this is that weather etc. is exactly matched, but the danger is that energy use is proportional to weight (especially going uphill) and also the speed you travel at, and if these aren’t controlled, you might not get such useful data. In particular, if riders are drafting you may as well call the whole thing off! Before looking at energy used, it will be useful to calculate the respective weights. I looked at a fairly steep hill (7-8%) to broadly isolate the weight component. In this case the recumbent sustained 7.7mph for 247W, while the upright got 8mph for 239W. Knowing fairly accurately the all-up weight of one rider, we can crudely solve for the all-up weight of the other. In this case my own weight (inclusive of bike, spare clothes, tools, 2L of water) works out at roughly 6.5kg heavier than the rider on the upright. Notwithstanding the weight penalty, the recumbent rider travelled at the same speed using 8.5% less energy. Overall the recumbent used 5240kJ (36.9kJ per mile) whereas the upright used 5715kJ (40.27kJ per mile). The calculated efficiency for the recumbent is interestingly close to the 36.2kJ from my previous comparison, but the DF efficiency is much better than my commute’s 47.3kJ per mile. Quite a different result overall to the 24.5% saving on my commute – I suppose this highlights the difference between riding at 15mph and 20mph, which is my average speed for a commute, in terms of the recumbent’s aero advantage. Anyway, that’s quite enough geeking out on power data for one day. Hopefully this is thought-provoking – please drop a comment below if you have any feedback! Nice comparison; I am glad you did this. I suspect that the passive* energy benefits of the recumbent might be about as important as the CdA benefits, over the course of a 200K or longer. * the energy required to sit on the bike for some given length of time. Thanks for posting an interesting analysis. Excellent calculations AND riding. That amount of miles over a challenging profile (in my estimation) is quite an accomplishment – and all in the name of ‘science’…. It’s physically OK to ride, slaps a little on really rough ground, but no big deal. I’m not convinced it makes much or any difference to efficiency. I mainly did it for the psychological reason that I wouldn’t think the drivetrain could be improved! I’ve just got a bit of velcro on the fork leg, and the one idler on the power side. No tubes etc. I’ve been an amateur bicycleracer 25 years ago and stayed in good shape by frequent short but intensive upright workouts. 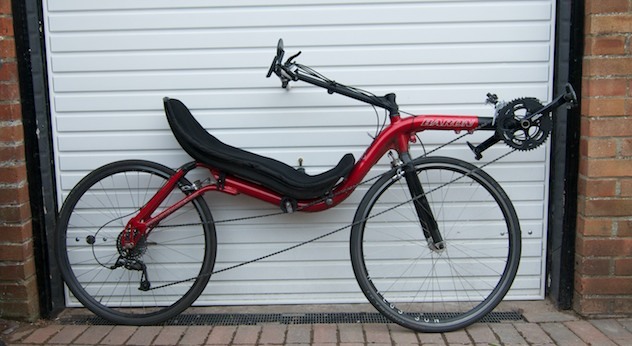 Some months ago now I changed to an old M5 recumbent due to neck problems and suddenly I felt 18 again! Gone was all the pain and numbness in parts of the body that were not primary propelling the bike, and all the focus could go to just the front thighs for pushing and the torso for breathing. Though I was not really impressed by the gears I was able to push in my usual cadence, I was really impressed by the feeling I could reach my VO2-max again after many years. It felt absolute like I could now make let’s say 20 minute intervals giving all that was in my body without having the feeling that some inner resistance was preventing me from using my maximum oxygen capacity. So, less (endurance) power in theory that is. But in real life the comfort of the free spinal chord means more relaxed limbs, and the more relaxed limbs are allowing the body to spend more time close to its VO2-max, so in real life the long endurance power can actually end up higher in my opinion. The reference towards the dutch web site is very interesting reading in deed . I swapped from a racing bike after many years to a high racer recumbent and don’t regret that. 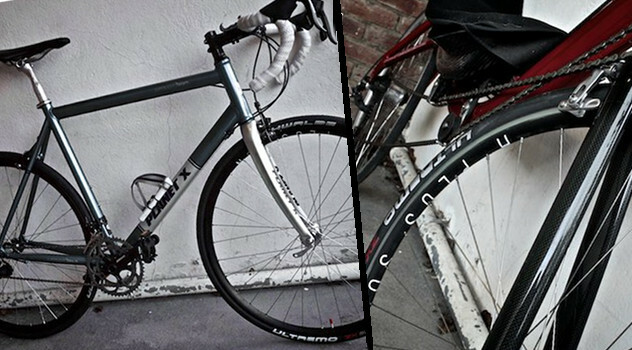 What i miss a bit in the above mentioned article from the english gentleman are factors like : What these bicycles weight is , the difference in chain length , the difference in geometry of the bikes , difference in main drive chain wheels and rear cassette setup ? Interesting I only wish I could go that fast on my recumbent I think my fastest is about 10 mph but is usually about 7.5 mph.